I realize that it is not fashionable to speak well of George W. Bush these days, even in some conservative circles. But the fact is that he was the hero of 9-11. We have gotten so used to Bush-bashing by the Whiner-in-Chief that it has even rubbed off on some ungrateful Republicans and conservatives. They are afraid to speak the truth about President Bush because they’re afraid that his “bad image” may rub off on the Romney campaign. They’re afraid it may hurt our chances of ridding the White House of the most hateful man ever to occupy it. I am sick to my stomach of hearing Obama blame Bush for his own economic failures. So before I explain why I consider President George W. Bush to be the hero of 9-11, allow me to set the economic record straight. While Bush was no fiscal conservative, Obama makes him look like a penny-pinching tightwad. Yes, Bush’s last deficit was the largest in history up to that time. But Obama’s first deficit (and every one since then) was two to three times larger than Bush’s. Let’s look at the reason for Bush’s deficit. We hear Obama constantly droning on about the terrible mess Bush left for him to clean up. I have even heard some Republicans talking about the “bad hand Obama was dealt.” But frankly, what he had to deal with was nothing compared to what Bush handled. First there was 9-11 itself. From a financial standpoint, in addition to the huge costs borne by the government for response and cleanup, there were the massive costs of rebuilding the Pentagon. The economy took a serious hit. Entire industries were decimated, including the travel and insurance industries. The stock market was closed for a week after the tragedy, and when it reopened stocks in general were massively down. But insurance and airline stocks were crushed, and hotel and car rentals were not far behind. Then there were the costs of the wars in Iraq and Afghanistan. Obama has alleged that Bush unilaterally decided to go to war. But America was clamoring for justice, and Congress (including the Democrats) voted overwhelmingly to authorize action. Obama decided that Iraq was a “bad” war, so he labeled it “Bush’s war.” With all his infinite wisdom and expertise in military matters, Obama decided that Afghanistan was the “good” war, so he adopted it. He announced that he was going to pull out the troops from the “bad” war and move assets over to the “good” war in Afghanistan. Then he proceeded to demonstrate his ignorance and spent billions on foolish policies, ignoring the advice of the generals to whom he had promised to listen. The bottom line? Most of the expenditures for the Iraq war had been made before Obama took office. And the cost of the escalation of “his war” – the one he decided was a just war – is on him. In summary, President Bush signed many spending bills that I believe he should have vetoed. But most of the money spent on his watch paid for the huge costs of 9-11 and the War on Terror. But he didn’t whine one bit about it. He didn’t blame anyone except the terrorists. He was a man, not a crybaby. What about Obama? He has made a career of blaming Bush for literally everything you can think of – the economy, the housing crisis, the bank failures. I think he even blamed Bush for the weather and acid rain. The press gave Obama a pass on this. They have held past presidents to the “one year rule.” Under that a president could blame his predecessor for the economy for his first year. After that, it became his economy. But the media has never held Obama accountable, because he was their creation. They elected him, and it would make them look flawed to admit the truth about him. Occasionally even Obama got tired of blaming Bush for everything about the economy, so from time to time he would change things up a bit. He has publicly blamed Congress, Wall Street, the banking system, Europe, China, the Middle East, Republicans, the Tea Party, American small businesses, the Japanese tsunami, gas prices, “headwinds” (his word), the Arab Spring - even ATM machines and electronic kiosks in airports! But not once has he accepted an iota of blame for himself. A true leader acknowledges his faults and failings. Obama is not a leader. He is a coward. There are three ways in which we should judge a leader – by their leadership in fiscal responsibility, moral and family values, and defense. I’ve already said I do not consider Bush to be a fiscal conservative, but he was a great moral conservative. He fought to support a Biblical, conservative American definition of marriage as between one man and one woman. And he passionately defended the rights of unborn citizens, believing them to take precedence over the “right” of a woman to murder her baby because she was too lazy to use birth control. Bush was also a masterful defense conservative. First, he gave America hope in the dark days following 9-11. 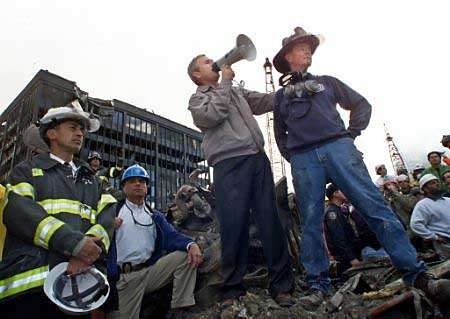 He stood at Ground Zero and defied the evil powers that had murdered 3,000 innocent American citizens, and became our voice, the voice of a hurting nation. Second, he resisted public pressure to do something, anything, to exact revenge for the terrible attacks of 9-11. Instead, he instructed the intelligence community to gather information so that we could make informed decisions in determining who was responsible for the attacks. Third, he declared a War on Terror that was so successful that we were kept safe during his two terms – and even during Obama’s term as president. Try as he might, Obama was unable to dismantle the infrastructure that prevented dozens of terrorist attacks on the U.S. For instance, one of Obama’s first Executive Orders was requiring the closure of the Guantanamo Bay detention facility within one year. But public pressure (and some insight and wisdom from within his own adminstration) kept that from happening. Everything that Obama shamelessly takes credit for in the area of defense was set in motion by Bush. Obama didn’t “get Osama bin Laden.” The Seals did. Bush had already laid the groundwork for his demise. Before he became president, Obama complained that Bush was wasting resources looking for “one man.” After intense pressure from his own, Obama was forced to relent and give his permission to take out bin Laden. He had no choice but to approve the mission. If he hadn’t, people in his own administration would have blown the whistle on him. The difference between Bush and Obama in military matters? Bush was a military man. He knew when to keep his mouth shut, and he never bragged about what he did. Obama? He wasn’t even a Boy Scout. He is most likely the least qualified Commander-in-Chief in history. As an ongoing braggadocio, he regularly takes personal credit for what our military heroes have accomplished. Furthermore, he has leaked classified information designed to aggrandize himself while endangering service personnel. I called George W. Bush the hero of 9-11. Some will say “what about the cops, firefighters and military personnel?” Having been a deputy sheriff, a firefighter-paramedic, and a U.S. Marine, I can tell you that most of these people would say they were just doing the jobs they had sworn to do - that they were not heroes. And this is exactly what most of the people who responded to the attacks said publicly. But if any one person could be considered the hero of 9-11, it would have to be George W. Bush. On a human level, Bush possessed the stunning ability to console a devastated nation that was reeling in grief. He gave the nation courage with both his actions and his words. 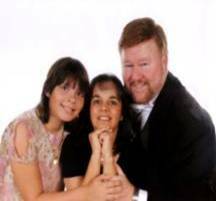 He defined the situation following 9-11 and determined a just and effective course of action. Most importantly, he kept us safe. I shudder to think where we would be today if Barrack Hussein Obama had been president on September 11, 2001.